Has anyone noticed that I'm obsessed with CASE Study Challenges this month! That's because I've discovered an amazing designer - Kathy Racoosin and I absolutely love her style! This is the last CSC challenge with Kathy as the muse this month and I could not make any other cards until I've done this one. Here is my card and the CSC159 card after that. Thanks for dropping by! Neenah Solar White and Desert Storm card, Papertrey Ink Lovely Layers and Bows and Ribbons, Hero Arts Navy midtone ink, MFT Fishtail layers STAX, Sizzix Tim Holtz embossing folder, American Crafts brad, Hemp from Hemtique, white gel pen. Casing Kathy Racoosin Take 4! I've really enjoyed casing Kathy Racoosin at the CASE Study Challenges this month. She has made me step outside my comfort zone and taken me to another level in paper crafting, so Thank You Very Much Kathy and CSC!! 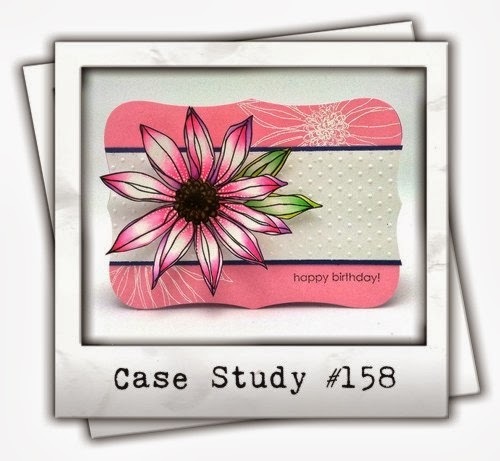 The card for CSC159 has repeated stamping and layered fishtail die cuts. I went looking for the original card which Kathy posted last year to find out how she did it. I actually quite like her case of that card posted on CSC159 and decided to make that instead. If I have more time on the weekend, I might case the original card. Here is my card with her two case cards below that. 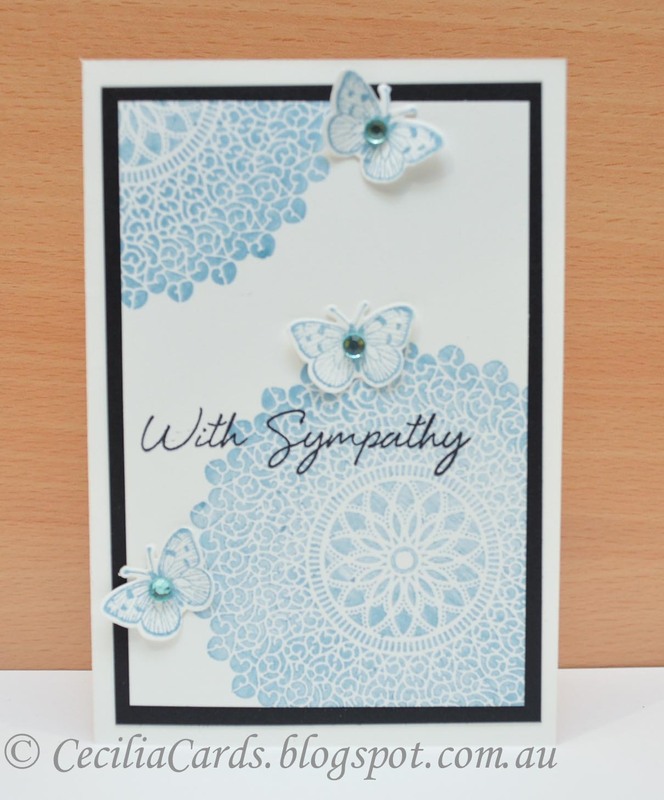 I'm also submitting this card to Simon Says Stamp Anything Goes Challenge as the dies and embossing folder are available from SSS. 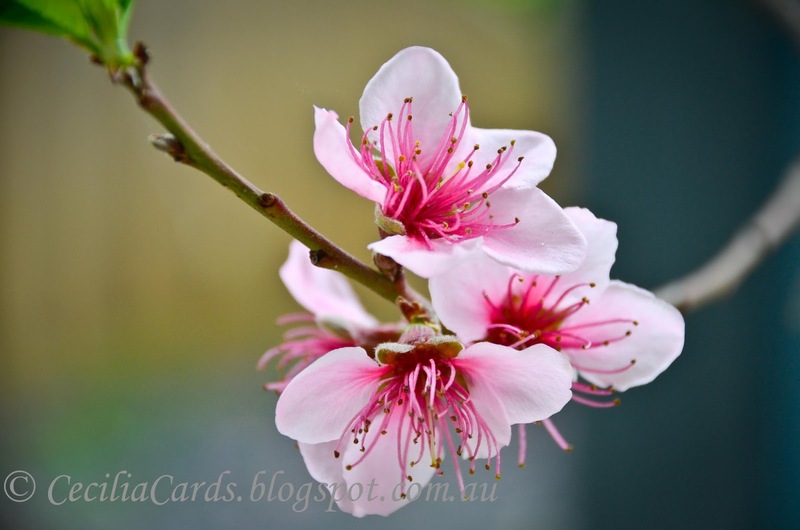 I may send this card to Paper Crafts' 2013 World Card Making Contest - Thank You Category. Thanks for dropping by! Yay! 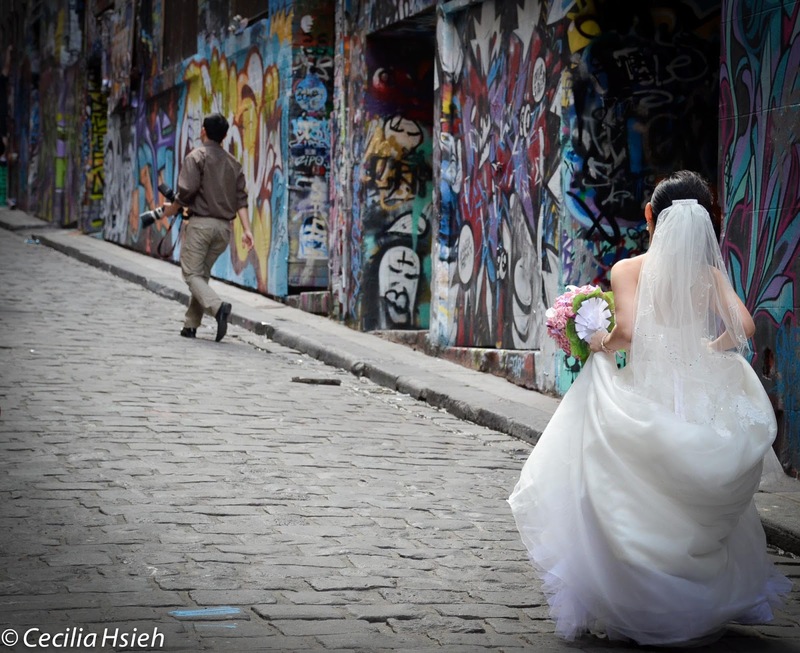 Another publication is out this week. 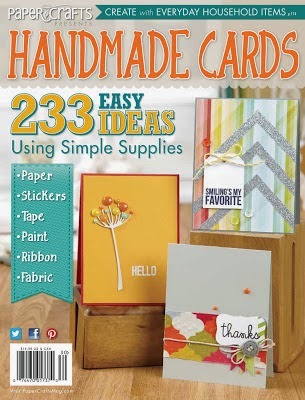 I have a digital version of the magazine, and my card is on page 15 in the 'Basics Supplies' section, right next to Vera Yates' card! I'm now working on the next publication submission for Card Creations V12, wish me luck! 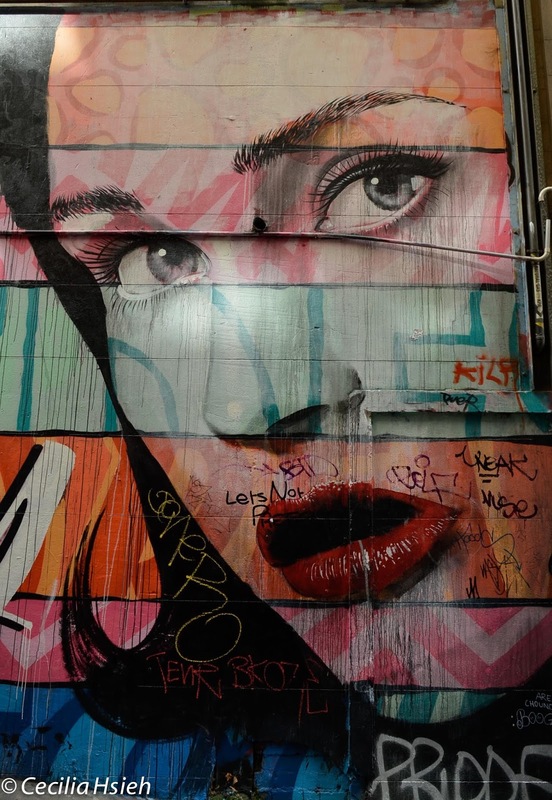 Link to where the magazine can be purchased online. Stamp Friend Definition in Field Green onto 2 patterned papers. 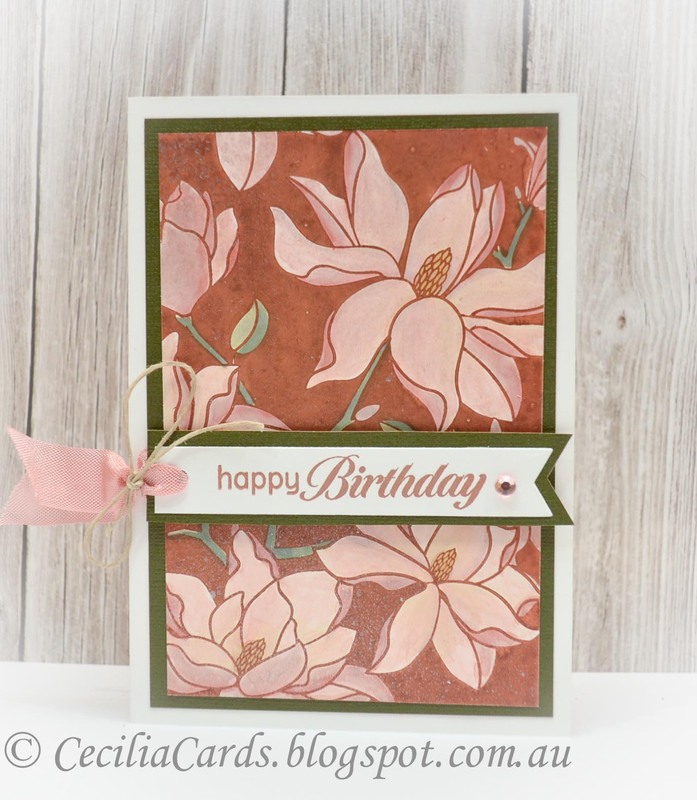 Die cut rose dies from one and the leaves from green patterned paper. Adhere the other pattern paper onto contrasting paper as shown. Adhere onto cardstock base. Stamp sentiment in coffee on white fishtail flag, mat with contrasting paper. 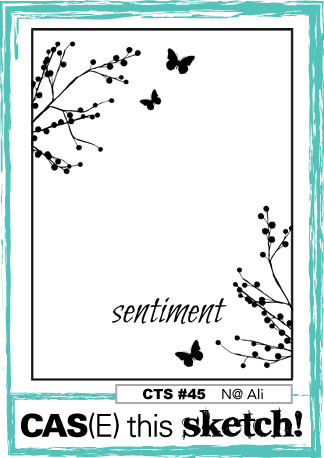 Adhere sentiment onto card, hiding where the patterned papers are joined. Curl rose petals with a pencil and assemble. 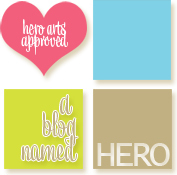 Attach onto sentiment banner with dimensional foam. 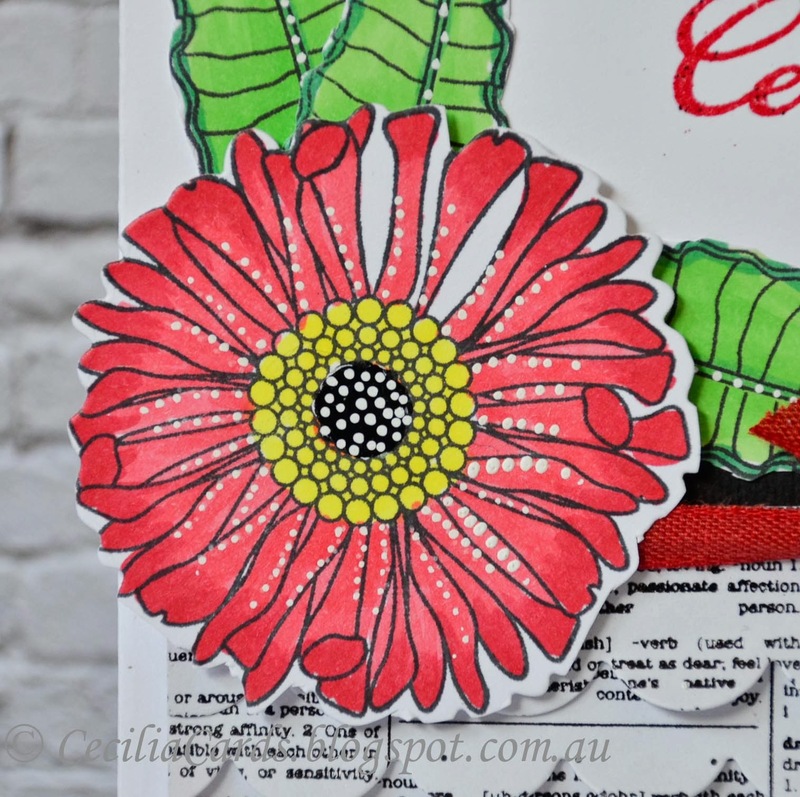 When I first saw the Wreaths challenge for the PTI September blog hop, I wanted to ink up my newly acquired 'Happiness in Bloom' stamp set, just perfect for this challenge! When I inked up the first card, I wasn't quite happy with it and decided to do a smaller second card (12x12cm). The second card uses the colours of the Colour Throwdown challenge #261. When stamping the second card, I wanted to try Bokeh stamping and went a little bit overboard... I went back to the first card and added to it. These are the end results, I think I like the second one better, what do you think? 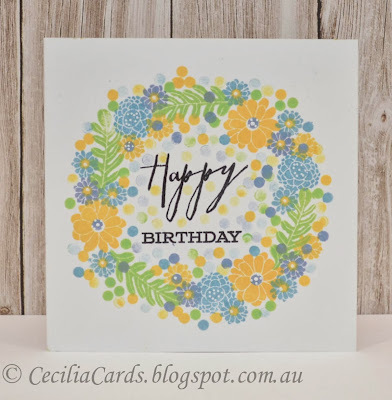 I'm also linking this card to Simon Says Stamp Anything Goes Challenge even though the PTI stamps are not available at SSS, all the inks and enamel dots I used were purchased from SSS. I'm also adding them to Moxie Fab World's Handmade Cards Week Colour Media challenge. By the way, I was very happy tonight, my card for CASE Study Challenge 158 was picked as the winning card... Yay! My first win in CSC! Neenah Solar White, PTI Happiness in Bloom, Hero Arts Pale Tomato, Butter Bar, Pool, Stone Wash, Field Green and Green Hills, Ranger Archival Jet Black, Blue Marker, MME enamel dots. I have two friends who recently moved into a new house and I thought this stamp would be perfect for the occasion! 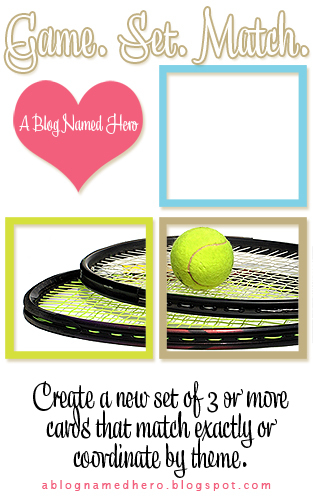 After I made the two I needed, I decided to do two more in different colours to make a set for A Blog Named Hero's Game Set Match challenge. I used a combination of alcohol and water based colouring for the house as I wanted the house to have that colour wash look. 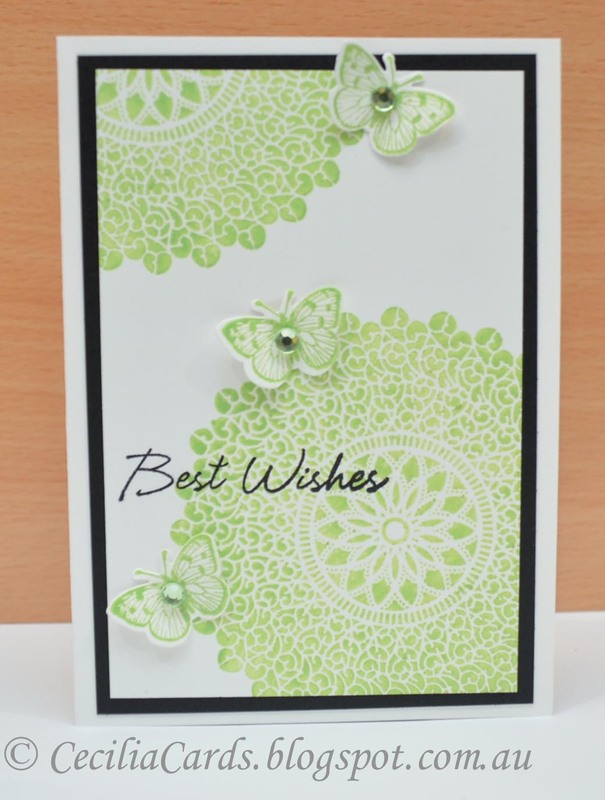 I'm also adding these cards to Moxie Fab World's Colour Media Challenge, and Simon Says Stamp Stamptember challenge.. The patterned papers I used are from Basic Grey Cut and Paste which I got in a paper exchange from Judy in Texas! I'm glad I'm finally putting the papers into good use! Thanks for dropping by! 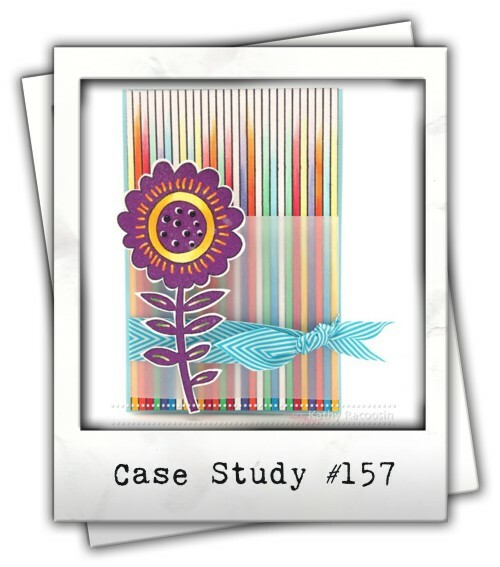 Neenah Solar White, Black cardstock, Basic Grey Cut and Paste 6x6, XPress It blending card, Hero Arts G5430 House with Plant and CL574 Say it all. Copic W3 W6 E25 E29 YR07 YG06, Distress Inks Scattered Straw, Broken China, Bundled Sage and Peacock Feathers, Momento Tuxedo Black, Versamark, White Embossing powder, Papertrey Tag die, seam binding, hemp from Hemtique, white gel pen. Casing Kathy Racoosin - Take 3! 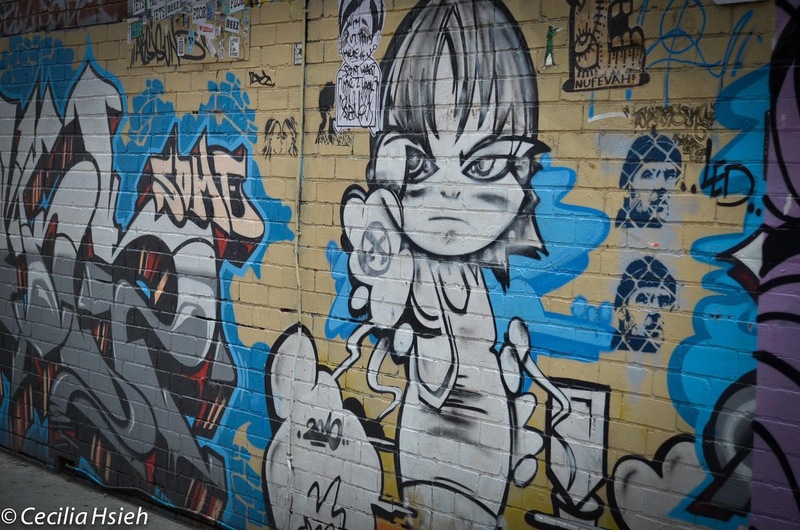 It's been a fun month of challenges at CASE Study Challenge. It has made me colour with Copic markers! 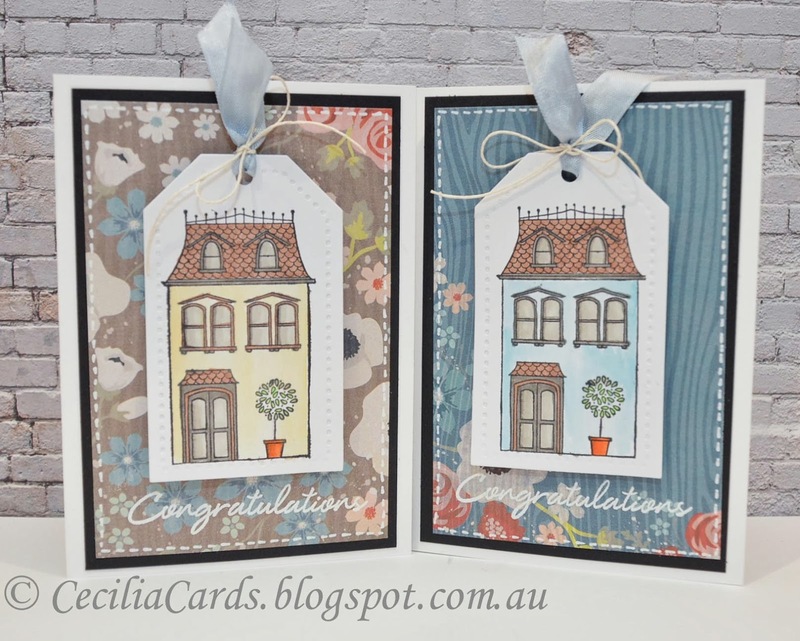 I have decided to combine the challenge with the Papertrey Ink's Make It Mondays - Layered Border Diecuts challenge. 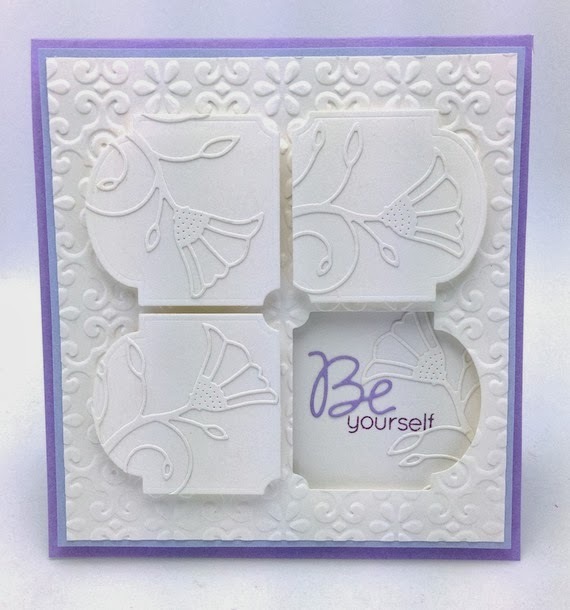 I don't have any border diecuts from PTI so I used the MFT scallop die cuts instead. I have really challenged myself with this card as I have been wanting to try the layered border technique and the Copic colouring for so long! Just needed that little bit of a nudge!! 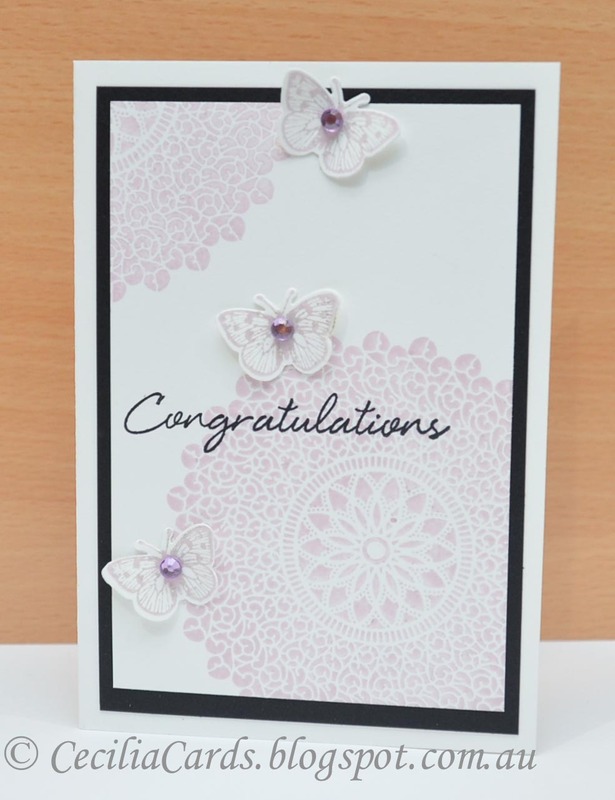 I'm also submitting this card to Moxie Fab World Handmade Cards Week Colour Media Challenge. This card was a winner for CSC158! Yay!! 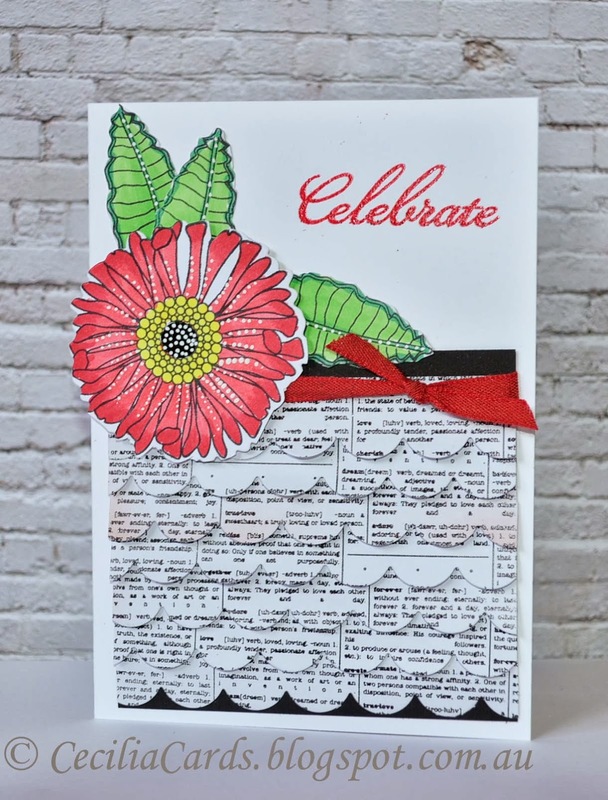 Xpress Blending card, Neenah Solar White, Kaisercraft Porcelain Rose 6x6, PTI Ribbons and Bow, PTI Year of the Flowers-Daisy, Copic YG06 G17 R29 R35 Y06, Versamark, Momento Tuxedo Black, MFT Scallop Die, Red glitter EP, Black marker, white gel pen, red ribbon. 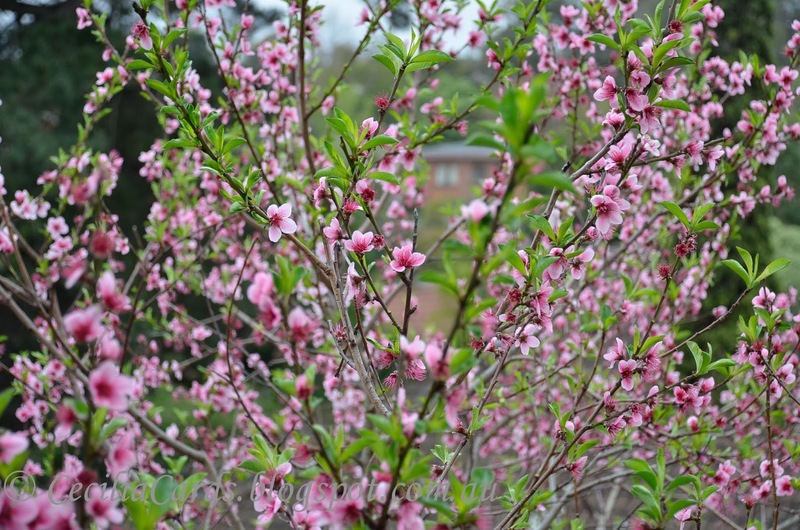 It is now Spring in Melbourne and it is the most wonderful time of the year with the weather warming up and blossoms on our fruit trees blooming and new leaves appearing. 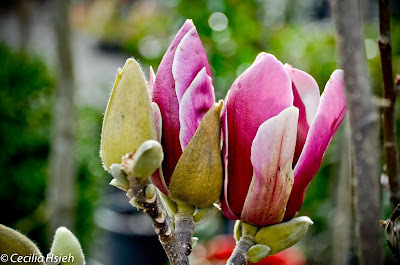 We recently planted two Magnolia trees in our front yard, but they have not bloomed yet, we may have to wait until next year. 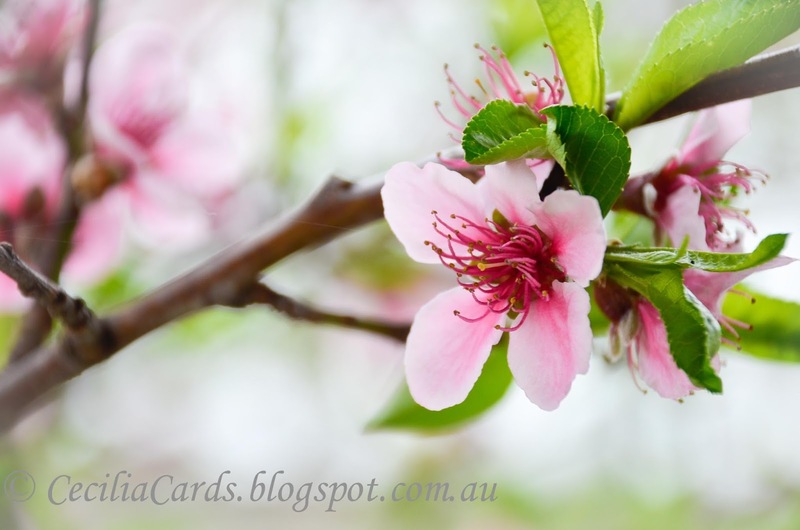 This card was inspired by all the spring flowers. 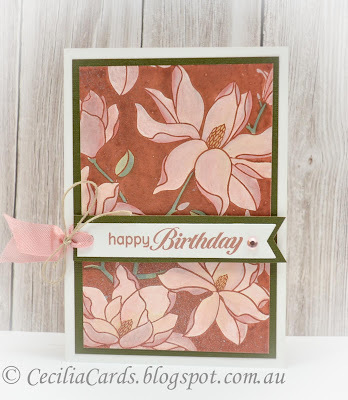 The card was stamped with Archival Brown ink and coloured with distress markers and misted with Perfect Pearls. 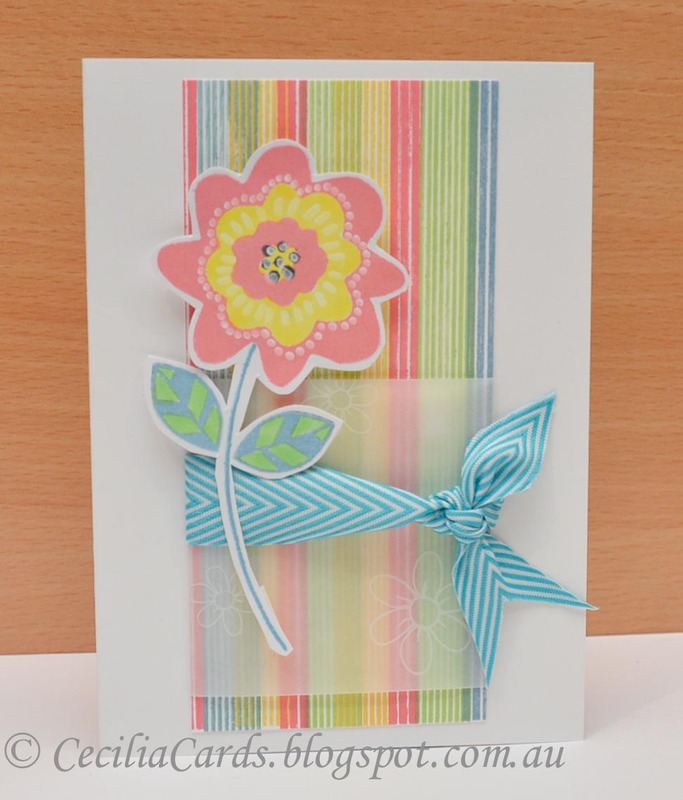 I'm sharing this card on Moxie Fab World Handmade Cards - Colour Media Challenge. I also have a photo of some lovely Magnolias I photographed at a recent trip to a Nursery (Yes, I bring my camera to the Nursery!) 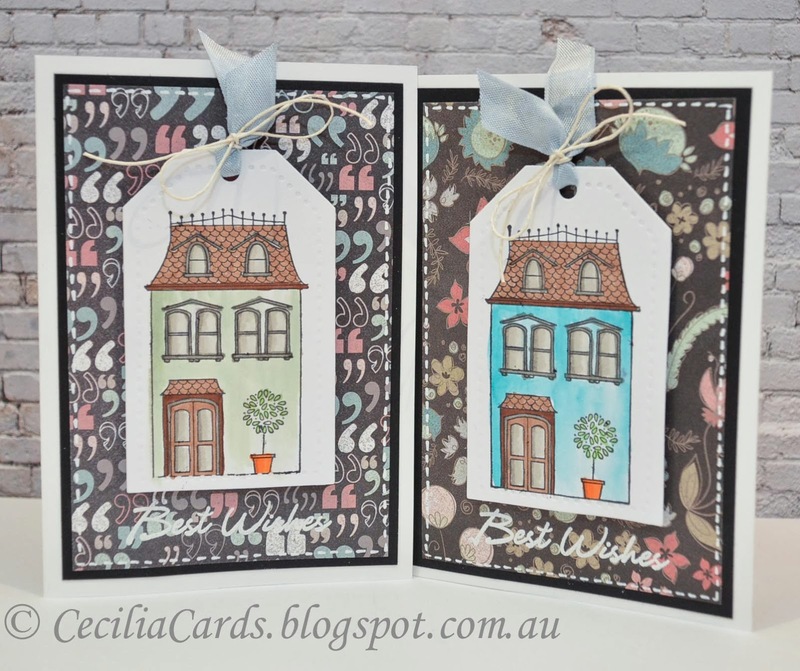 As both these stamps are available from Simon Says Stamp, I'm linking up to SSS Stamptember Challenge. For those who follow my blogs, I rarely do sets of cards. I was challenged by A Blog Named Hero's Game Set Match challenge to do a set of cards. 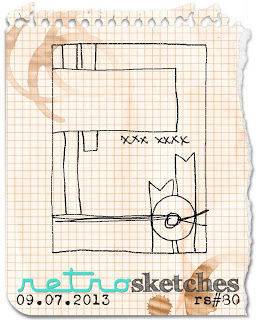 I used the CAS(E) this Sketch #45 as the base of my card. 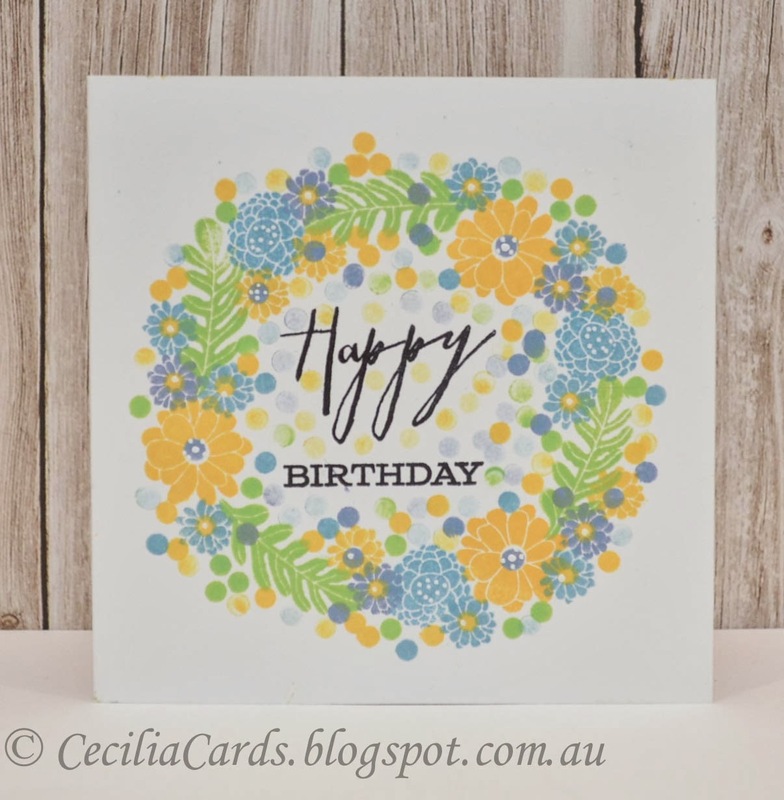 I originally wanted to use Leafy Vines but could not get it to work for me, so I switched to an old stamp that I bought when my stamping obsession started over a year ago. I also wanted to make them all a different colour each so that I could submit them to Rockwell Designs Pantone Challenge. Here are my cards.... now I have to think of a similar design for mass producing Christmas cards! 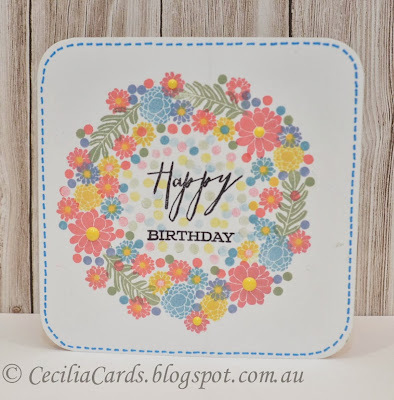 As both these stamps are available from Simon Says Stamp, I'm linking up to SSS Stamptember Challenge. Have I ever mentioned that I love washi tape? One of my favourite techniques with Washi tape is die-cutting. Here is my card using two tapes and the Spellbinders Rose Creations dies. 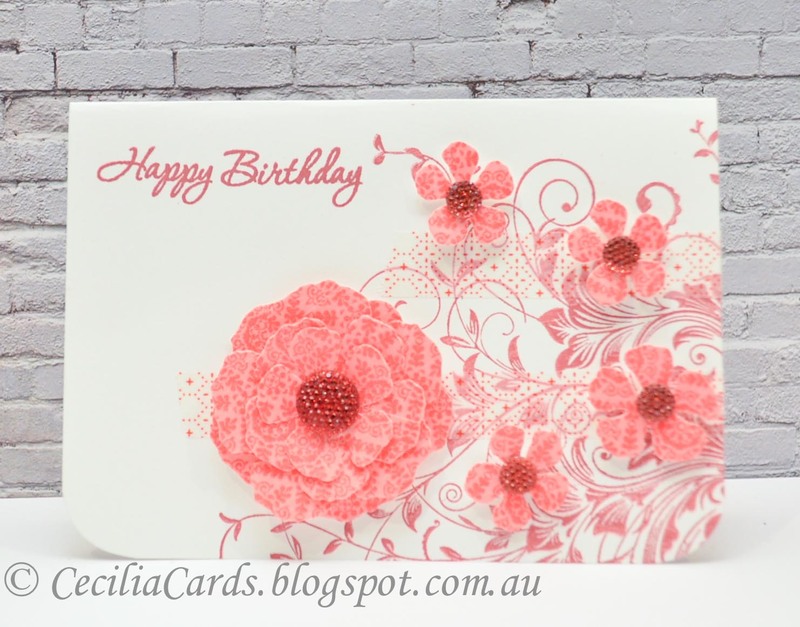 I'm submitting this card to Moxie Fab World Handmade Cards Week -Stickers and Tape Challenge and Rockwell Designs - Pantone Poppy Red Card Challenge. Look out for my card in Handmade Cards! Thanks for dropping by! 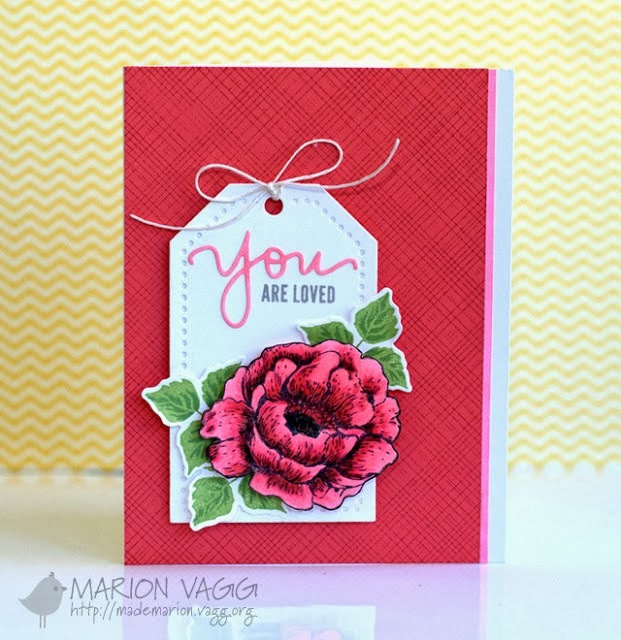 As both these stamps are available from Simon Says Stamp, I'm linking up to SSS Stamptember Challenge. Here is a quick card I made a while ago for a Pub Call but never made it. 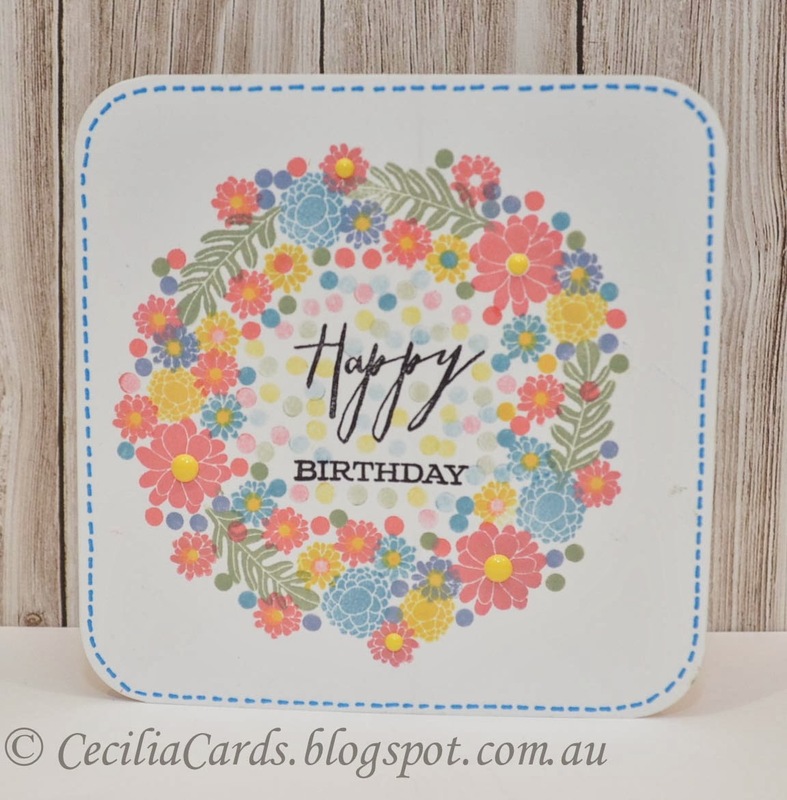 I used embellishments that were in the Kaisercraft 6x6 pad for this card with a bit of stamping from Kaisercraft and Paper Smooches. I just love the PS Digits dies! 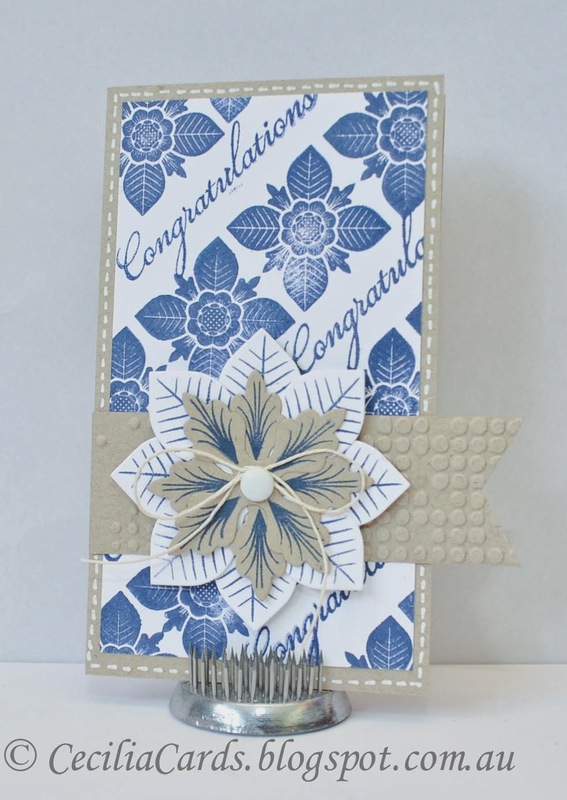 I'm submitting this card into Moxie Fab World's Handmade Cards Week Challenge - Ready Made Embellishments and Paper Smooches Guest Designer Search. Thanks for dropping by! Neenah Desert Storm, Kaisercraft Rewind 6x6, Kaisercraft Rewind Clear Stamps, Paper Smooches Digits, Ranger Archival Jet Black, Hero Arts Soft Granite, Ranger Distress Rusty Hinge. 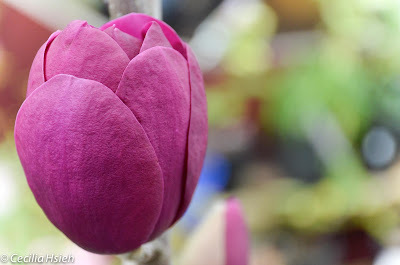 After having such fun last week with CASE Study Challenge, I had to join in with Challenge 157 this week. At the last Craft Show I attended, one of my last purchases before I left was a packet of chevron ribbon in three colours. 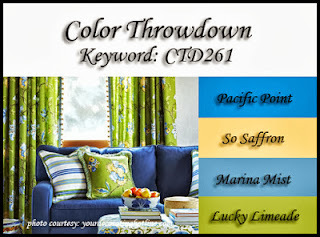 When I saw Kathy Racoosin's CASE card, I was very happy I picked the right colour! 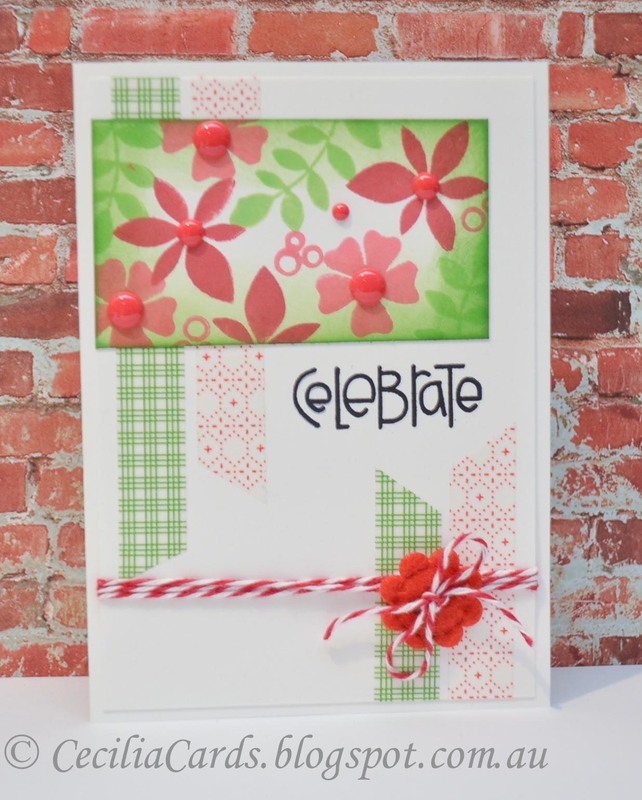 I'm also entering this card to Moxie Fab World's In Transition challenge and Paper Smooches Guest Designer search. Thanks for dropping by! Woohoo, two cards in one weekend!! Notice the patterned vellum paper and the matching ribbon! Neenah Solar White, PTI Super Stripes, Paper Smooches Calico, Hero Arts Butter Bar, Green Hills, Pool and Pale Tomato, Copic Markers Y06, YG06, White gel pen, Ribbon and Patterned Vellum. When I saw the Make It Monday video on PTI Capture the Moment, I wanted to try it but had to wait until the weekend until I had a bit of time to experiment. I didn't want to do it the same way as Betsy Veldman as I thought it would be too messy with Post-It notes. 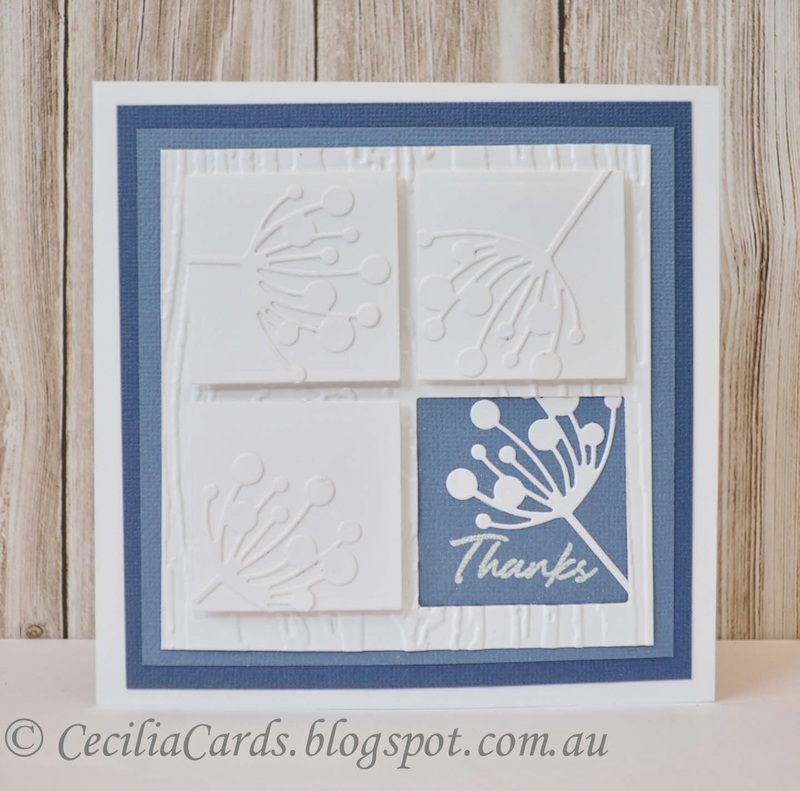 I used double sided tape with pre-cut lines before I embossed. Afterwards, I just peeled off the tape layer by layer. I also used a technique shared by Jennifer McGuire for the sentiment die (3 layers of cardboard). 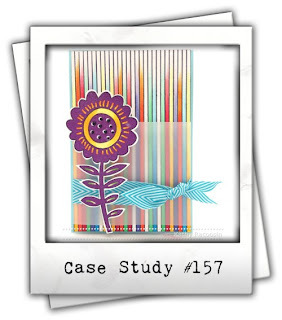 The background stamping is done with my new PTI Super Stripes stamp set. The extra colours are added with markers and gel pens after stamping. The sentiment was originally stamped with Delicata gold pigment paint, but I had to quickly emboss this in gold as it didn't quite stand out against the stripes. I left this card unembellished as this will be a card for a male. As I used gold embossing in this card, I'm also submitting this for Moxie Fab World All that Glitters is Gold challenge, Simon Says Stamp Embossed Challenge and Moxie Fab World Tuesday Trigger In Transition. Thanks for dropping by! 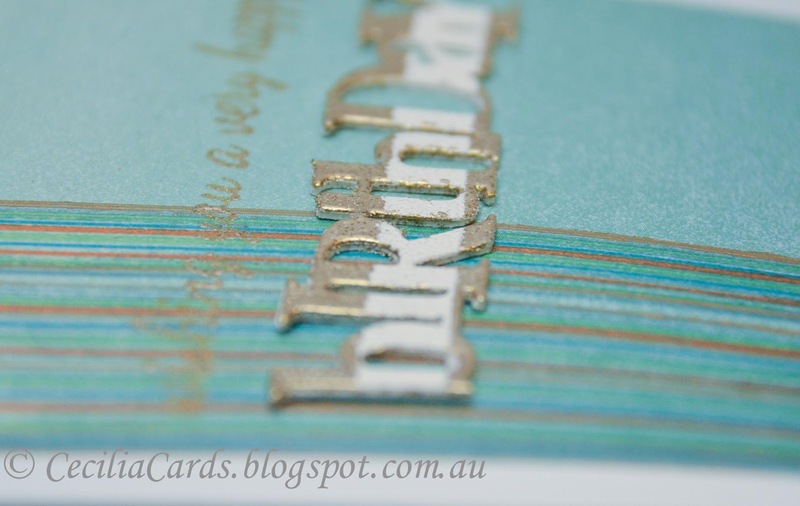 A close up to show the extra layers of die cuts and the embossing. 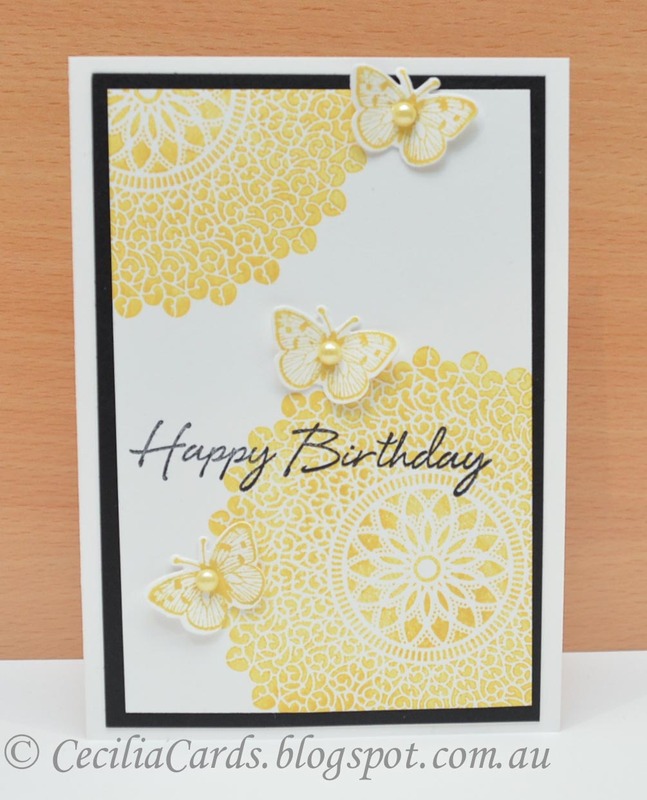 Neenah Solar White card stock, Basic Grey Cut and Paste 6x6, PTI Super Stripes and Wonderful Words-Birthday, PTI Birthday Die, Hero Arts Pool, Delicata Gold, Copic YR07, YG06, B06, Gold metallic paint, Gold and White embossing powder. I made this card a while ago for a washi tape publication submission. Needless to say, it never made the 'cut'. When I saw Moxie Fab World's 'All that Glitters is Gold' challenge, I decided to showcase this card. 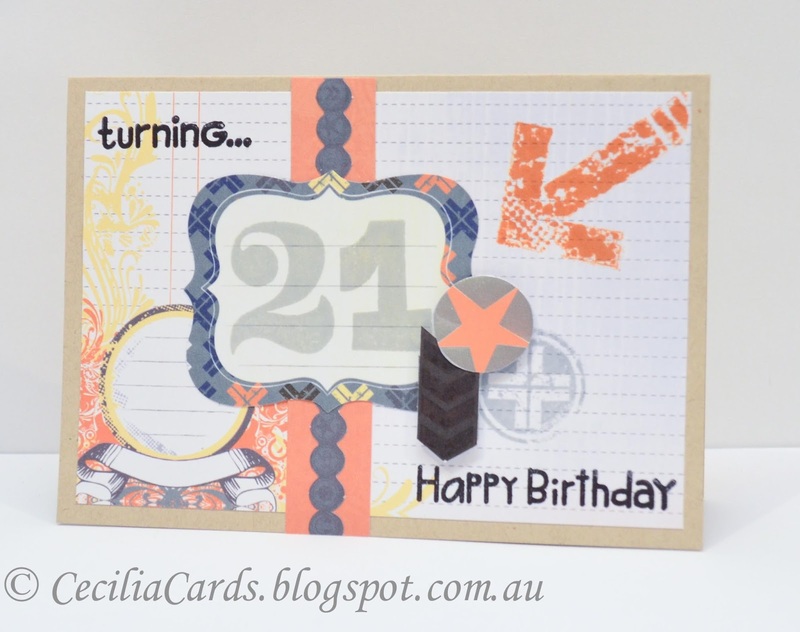 This card has no stamping (a sentiment can be added inside later) and is all made with Washi Tape or MT Masking Tape. Previous cards I've made with washi tape have been blogged here (my second most popular all time post) and here. Thanks for dropping by! Edited - this card will also be submitted to Moxie Fab World Handmade Cards Week - The Stickers and Tape Challenge. 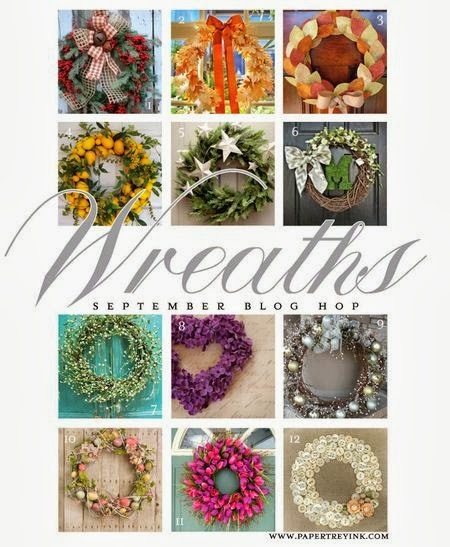 I can't wait for this magazine to come out as I have a card in it! Neenah Solar White, Spellbinders Nestabilities Standard Circles and Rose Creation Dies, MT Tapes, Gold Brad and Twine from The Twinery. 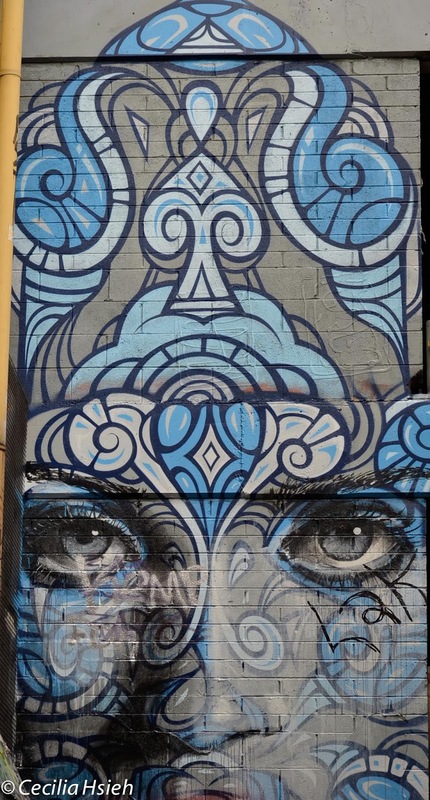 Did anyone see today's CASE Study CSC156 results today? I got Top 3 for this card! Another first for me! I was so happy and was keen to make another card tonight. 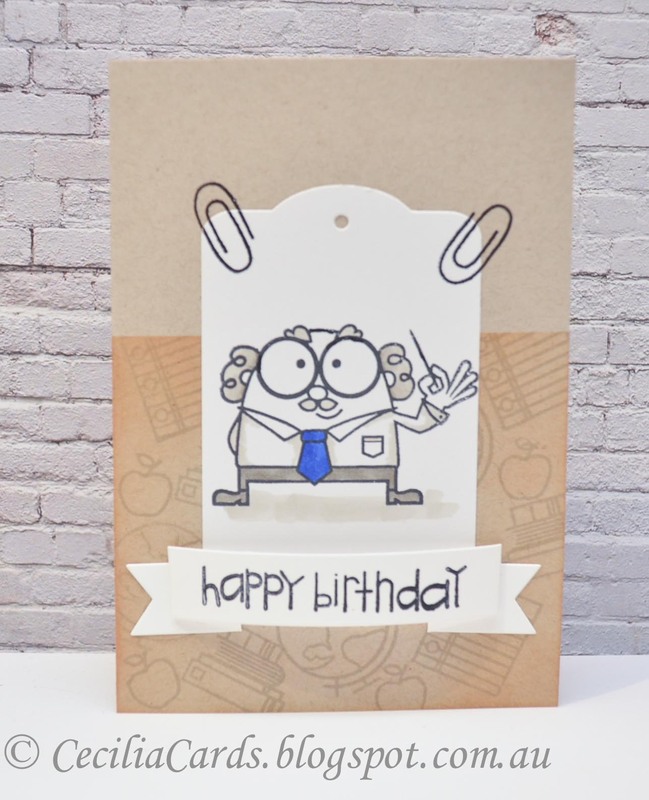 I used the Paper Smooches Sparks Designer Draft sketch to base my card. I wanted to try out my Copics markers and make a fun card (for a teacher of course). 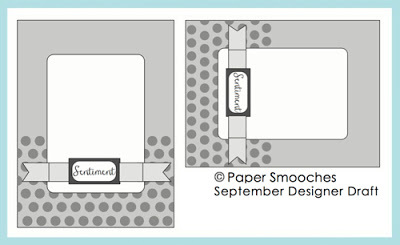 I'm submitting this card to Paper Smooches Sparks September Designer Draft and Paper Smooches Guest Designer Search. Thanks for dropping by! 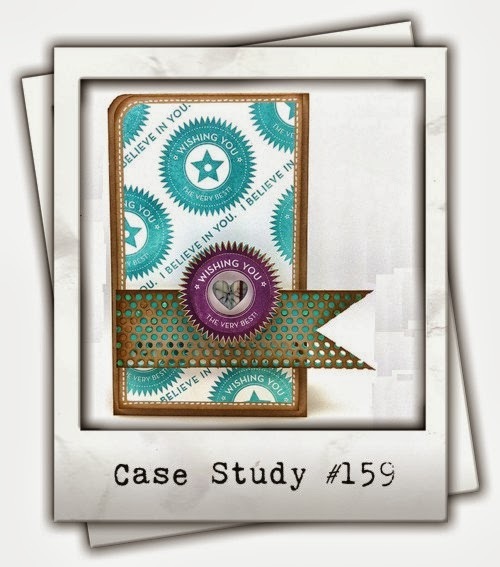 Neenah Desert Storm, ExpressIt Blending Card, Paper Smooches Sentiment Sampler and Smarty Pants, Simon Says Stamp Folded Banner die, MFT Tag Die, Hero Arts Wet Cement, Tim Holtz Tea Dye, Ranger Archival Jet Black, Copics W3, W6 and B29. I only managed one card this weekend. I have two more planned, but they will have to wait for another free night this week. 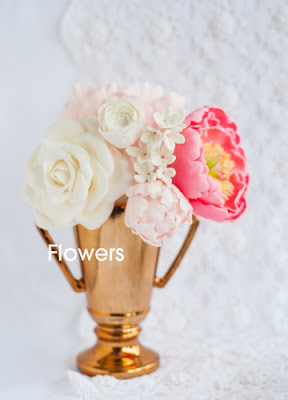 This one is for the current Paper Smooches Trend Watch Flowers challenge. I've been dying to get into my craft room to do this all weekend! 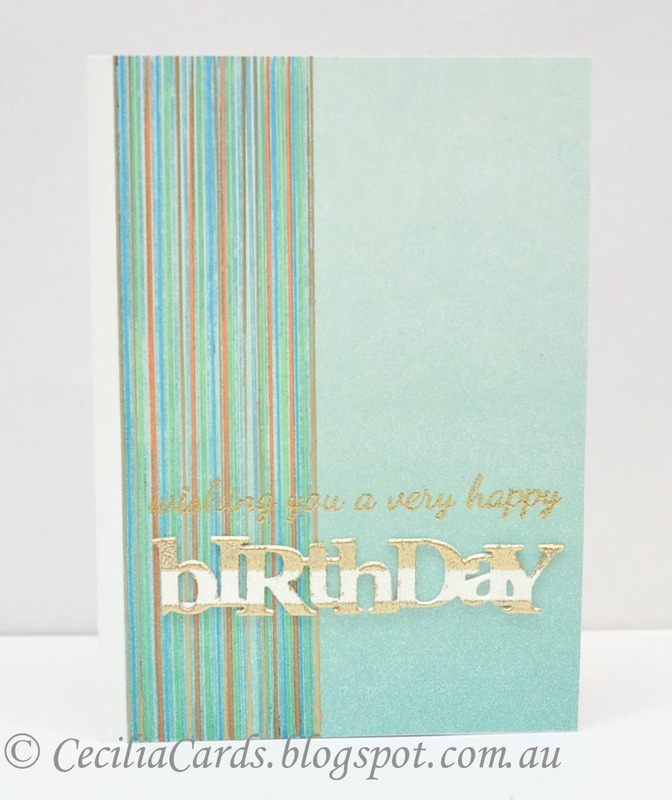 Here is my card using the current Retro Sketch 80 with the Reflections stamp set and matching MT Masking Tapes. Edited to Add - Moxie Fab World Handmade Cards Week - The Tapes and Stickers Challenge. 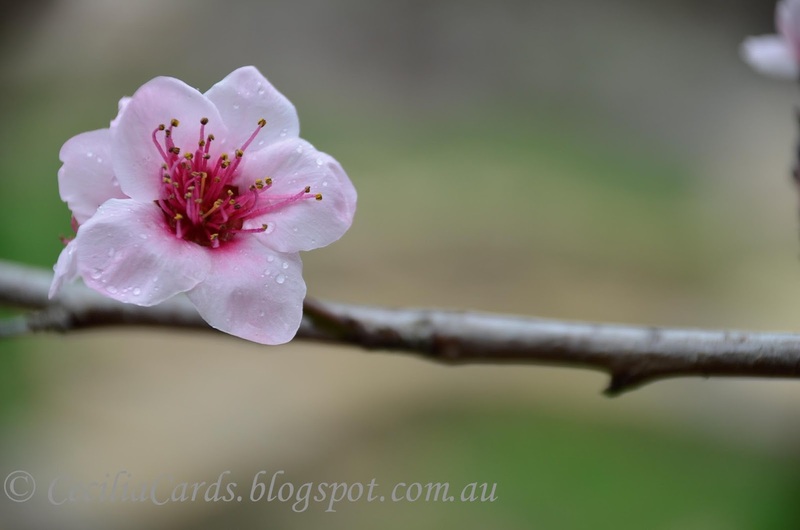 It is also Spring in Melbourne (the weather has suddenly warmed up and the blossoms are in bloom) and I would like to share some photos taken on the weekend in our backyard. Thanks for dropping by! Neenah Solar White, Paper Smooches Reflections and Sentiment Sampler, Ranger Archival Jet Black, Hero Arts Pale Tomato, Red Royal and Green Hills, Tim Holtz distress ink Mowed Lawn, Twine from The Twinery, Hero Arts Fancy Felt Buttons, MT Masking Tape, Enamel Dots from My Minds Eyes.